BACKGROUND AND PURPOSE: Pulsatile tinnitus (PT), a common disorder, can be caused by a variety of otologic and vascular lesions. Various imaging modalities, including CT, MR imaging and angiography, and conventional angiography, have been used in the assessment of PT. Ideally, a single imaging study to evaluate for the largest variety of etiologies would be optimal. In our study, we examine the potential for CT arteriography and venography (CTA/V) in the evaluation of PT. METHODS: Sixteen patients with PT were prospectively evaluated by an otolaryngologist, had a normal otologic examination, and were referred for a CTA/V. All examinations were performed on a 16-section multidetector CT. The carotid bifurcations, internal carotid artery course, transverse and sigmoid sinuses, jugular foramen, internal jugular vein, sella turcica, and temporal bones were evaluated. RESULTS: Seven of the 16 patients had lesions on CTA/V that could account for their PT. Examples of pathologic conditions in the series included a significantly dominant venous system, a venous diverticulum with stricture, and a transverse sinus stenosis. CONCLUSIONS: Preliminary findings indicate that CTA/V can be a valuable imaging tool in the assessment of PT. With this technique, arterial, venous, middle, and inner ear causes of PT can be excluded. Tinnitus, the perception of sound in the absence of external stimuli, affects more than 50 million Americans, is equally prevalent in men and women, and is most common in people aged 40 to 70 years.1 The work-up of pulsatile tinnitus (PT) has involved various imaging modalities. For a patient with a retrotympanic mass, CT of the temporal bone without contrast is obtained to evaluate for aberrant or lateralized internal carotid artery (ICA), persistent stapedial artery, high-riding jugular bulb, glomus tympanicum, or cholesteatoma. For a patient with a normal otologic examination, an MR imaging examination and an MR angiogram (MRA) are obtained to evaluate for causes related to common carotid artery disease, ICA disease, and benign intracranial hypertension.2,3 A patient with a negative imaging work-up and objective PT may undergo conventional angiography to determine whether a dural fistula is causing the tinnitus or if there is a venous cause.3,4 Therefore, patients may undergo temporal bone CT, MR imaging, MRA and catheter angiogram during the course of the work-up. Ideally, imaging would involve a single examination. For those patients with a middle ear mass, a contrasted examination would not be needed, though a CT angiogram and venogram (CTA/V) may provide more detail regarding the nature of the lesion. With the availability of multidetector CT, CTA/V has become a standard examination. CTA/V could serve as that single examination by providing high-resolution images of the temporal bones to evaluate for a middle ear lesion, an arterial phase to evaluate for carotid bifurcation or ICA pathology, and a venous phase to evaluate the size, patency, and integrity of the major venous sinuses and internal jugular veins. The purpose of this preliminary study was to evaluate the utility of CTA/V in the imaging work-up of PT. Sixteen patients were evaluated prospectively. All patients had PT, were evaluated by an otologic surgeon, had normal otologic examinations with no evidence of middle ear mass, and were referred for CTA/V. If the tinnitus was diminished by external compression of the jugular vein, it was presumed to be venous in origin. If compression of the ipsilateral carotid artery resulted in decrease in the tinnitus, it was presumed to be arterial in origin. Nonionic contrast (100–150 mL) was injected via power injector through a 20-gauge right antecubital IV at a rate of 3–4 mL/s. Imaging was performed after a fixed delay of 22–25 seconds (to allow both arterial and venous opacification for a single phase scanning). Thus, arterial and venous phases of the examination were obtained during a single acquisition rather than a dual phase examination, because superimposition of arterial and venous structures is usually not a problem in this anatomic region, and a dual-phase examination would expose the patient to additional radiation. All examinations were performed on a 16-section multidetector CT (Lightspeed 16; General Electric Healthcare, Waukesha, Wis) with 350 mA and 120 kV. A 0.5-second gantry rotation time was used with a detector configuration of 16 × 0.625 mm. The pitch was 1.375:1 with coverage of 13.75 mm per rotation. Examination time ranged from 7 to 10 seconds. Axial reconstructed section thickness was 1.25 mm with a 0.625-mm section interval (50% overlap) from the vertex to approximately the C6 level. All images were reconstructed using standard bone reconstruction algorithms. Source images were reviewed on a workstation. Bone window settings (width 3500, level 700) were used to evaluate the temporal bones. Narrower settings (width 450, level 150) were used to evaluate the arterial and venous system. Multiplanar reformatted images, maximum intensity projection images, and volume-rendered images were generated on a workstation by a neuroradiologist. Coronal reformations through the temporal bone were generated, as were coronal and sagittal reformations through the carotid artery bifurcations and posterior fossa venous sinuses. The temporal bone portion of the study included evaluation of the middle ear (for glomus tympanicum paraganglioma, cholesteatoma, aberrant ICA, or persistent stapedial artery) although no patient had a middle ear mass at otologic examination, otic capsule (for otospongiosis), jugular foramen (for high-riding or dehiscent jugular bulb), and ICA canal (to assess for aberrant or lateralized ICA). The common and internal carotid arteries were assessed as to patency, stenosis at the bifurcation, or presence of dissection. Characteristics of the transverse and sigmoid venous sinuses and internal jugular veins, such as patency, presence of diverticula, or strong unilateral dominance, were noted. Unilateral dominance was assessed on the axial images, and venous systems were identified as codominant if there was a difference of 3 mm or less in the diameters of midtransverse sinus. Finally, sagittal and coronal reformations through the sella turcica were obtained to exclude an empty sella, a secondary finding of benign intracranial hypertension. Nine women and 7 men comprised the study population. Ages ranged from 27 to 73 years (average age, 49 years). The tinnitus was right-sided in 11 of 16; 4 of 16 complained of left-sided PT, and 1 of 16 had bilateral PT. Only 1 patient had tinnitus that could objectively be heard by the examining physician. Six of 16 patients had tinnitus that was presumed venous, and 5 of those 6 reported that the tinnitus decreased with compression of the right jugular vein, and 1 of 6 noted decrease in PT with left neck compression. Only 2 of 16 had PT that was suspected to be arterial in origin, based on obliteration of sound with pressure on the ipsilateral ICA. The remaining 8 patients had PT that was not clearly arterial or venous by history or physical examination. Five of 16 patients had normal CTA/V examinations, with normal temporal bones, codominant venous sinuses, normal sella turcica, and no arterial stenosis. Six patients had strongly dominant venous systems, and in all but 1 of these patients, the tinnitus was reported on the side of the dominant transverse and sigmoid sinus (Fig. 1). Five were right-sided and 1 was a dominant left venous system. In 3 of these 6 patients, the sigmoid plate between the dominant transverse sinus and the ipsilateral mastoid complex was extremely thin. Dominant left venous sinus system in a 27-year-old woman with left-sided pulsatile tinnitus. A, Coronal image at intermediate window demonstrates a dominant left sigmoid sinus (arrows). B, Note the markedly dominant left jugular vein on this axial image at the jugular foramen level. One patient, who had 10 years of right-sided tinnitus, had a diverticulum of the right transverse sinus extending into the mastoid complex (Fig 2). CTV also showed a stricture of the midtransverse sinus, proximal to the diverticulum. Based on the CTA/V results, the patient had surgery to repair the diverticulum, noted resolution of the PT immediately after surgery, and remained asymptomatic at his most recent follow-up appointment approximately 3 months later. Venous diverticulum in a 69-year-old man with long-standing right-sided pulsatile tinnitus. 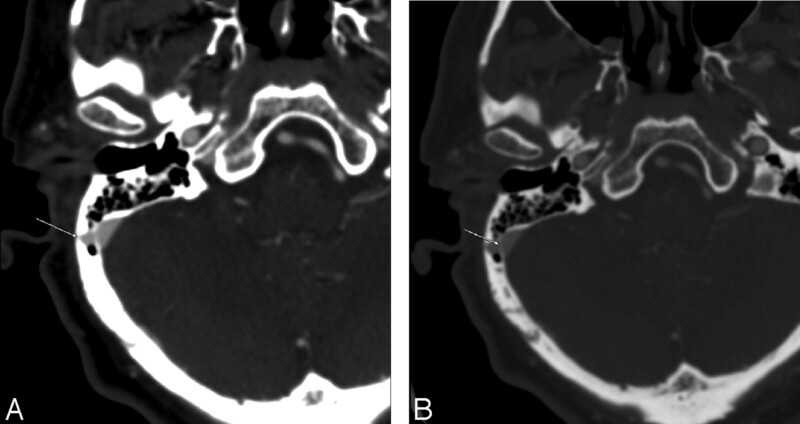 A, Axial image demonstrates a right distal transverse sinus venous diverticulum extending through a dehiscent sigmoid plate into the mastoid complex (arrow). B, Axial image, same level, wider windows for bone detail confirms the osseous defect and the diverticulum (arrow). Right transverse sinus stenosis was seen in another patient with right-sided PT (Fig 3). This finding was best appreciated on both axial and coronal reformations through the posterior fossa venous sinus system. One patient with left-sided tinnitus that diminished with compression of the left neck had a dominant venous system on the left with a high-riding jugular bulb, but without bone dehiscence. Transverse sinus stenosis in a 34-year-old woman with right-sided pulsatile tinnitus. A, Axial image in a vascular window demonstrating a distal right transverse sinus stenosis (arrows). B, Coronal image in a vascular window in the same patient demonstrating a distal right transverse sinus stenosis (arrows). A single patient with right-sided tinnitus had 70% stenosis of the right proximal external carotid artery. No other significant internal or external carotid stenoses were noted in our patient population. A single patient had mastoid air cell opacification on the side contralateral to the tinnitus, but the CTA/V was otherwise normal. Tinnitus can be subdivided into subjective and objective types.5 Subjective tinnitus is sound that is audible only to the affected person; objective tinnitus is sound that is produced within the ear or adjacent structures that can be heard by the examining physician. Tinnitus can often be further classified as either pulsatile or nonpulsatile based on the quality of sound that the patient perceives. Pulsatile sounds are usually caused by vibrations from turbulent blood flow that reach the cochlea. PT can be subclassified as either vascular or nonvascular in origin.6 Most causes of PT are vascular. Arterial causes of PT include carotid artery stenosis, carotid occlusion, dissection, fibromuscular dysplasia, a persistent stapedial artery, and an aberrant or lateralized ICA course. Venous etiologies include benign intracranial hypertension, a high-riding or dehiscent jugular vein, venous stenosis, venous diverticulum, abnormal condylar and mastoid emissary veins, or turbulent flow through a dominant jugular vein. Pathologic conditions of the middle ear (such as a glomus tympanicum or cholesteatoma) or labyrinth (such as otospongiosis) are other causes.3 Finally, another not uncommon cause is a dural arteriovenous fistula (dAVF), which may be difficult, though possible, to assess with CTA/V.4 If dAVF is likely, a conventional catheter angiogram should still be performed. In this study, bone window settings were used to assess the temporal bone on axial images and coronal reformations from the axial dataset. Thus, the potential middle ear causes for tinnitus were excluded, because the otologic examination revealed no middle ear mass, and the temporal bone CT showed a normal middle ear. With the CTA/V, an aberrant ICA can be confirmed by noting the normal location of the ICA, medial to a point bisecting the basal turn of the cochlea. The course of the ICA can also be corroborated on the CTA portion of the examination. A high-riding jugular bulb can be assessed by observing the jugular bulb at the level of the basal turn of the cochlea. Dehiscence of the jugular bulb can be detected by observing whether there is an intact petrous septum between it and the middle ear, and dehiscent distal transverse sinus is excluded if the sigmoid plate is intact. These findings could be corroborated on the CTV portion of the examination. A persistent stapedial artery is assumed if there is absence of the foramen spinosum, and an associated serpentine middle ear mass. None of these lesions was detected in our patient population, but the CTA/V was used to exclude them as cause of the PT. A vascular window (window width 450, window level 150) was used to evaluate for carotid artery stenosis. Window level should be set to discriminate between calcification and arterial enhancement. Carotid stenosis evaluation may be performed on the axial images by obtaining the smallest patent luminal diameter. Maximum intensity projection images were used for confirmation of the findings in multiple planes This window setting, though ideal for evaluation of the arterial system, was also used to evaluate for an empty sella (sagittal reformatted images) as well as small slit-like ventricles (axial images), findings that may be seen in benign intracranial hypertension. The vascular window (width 450, level 150) was used to evaluate the venous system of the head and neck, and to evaluate the size, patency, and integrity of the veins. The window level should be set to discriminate between the adjacent osseous structures. Etiologies such as sinus thrombosis, sinus stenosis, emissary veins, dehiscence of adjacent osseous structures, and prominent arachnoid granulations can be excluded. Furthermore, evaluation of the dural venous sinuses can be performed, because idiopathic intracranial hypertension may be associated with venous abnormalities. Although dAVF may be detected on CTA/V, we suspect that CTA/V is not as sensitive as conventional angiography for detecting dAVF. Unlike CTA/V, conventional angiography allows for selective catheterization of a vessel and dynamic imaging using digital subtraction techniques. Although abnormal collateral vessels could be detected by CTA/V, if the vascular phase of examination is not ideal, an arterial-venous connection may be missed. Therefore, if the CTA/V is normal, and the tinnitus is pulsatile and/or objective, conventional angiography may still be indicated. Finally, although these are preliminary findings, some of the imaging trends observed in this series are interesting and raise a variety of questions. All the patients in our series who had lesions that could potentially account for tinnitus symptoms had venous etiologies. Specifically, 6 of 16 demonstrated dominant venous systems and all but 1 corresponded to the side of PT, 1 of 16 had a distal transverse sinus diverticulum herniating through an osseous dehiscence into the mastoid complex, 1 of 16 had a high-riding jugular bulb, and 1 of 16 had a transverse sinus stenosis appreciated on the axial images and reformations in the coronal plane. Although venous etiologies have been recognized as potential sources of tinnitus,7–10 they have not been described as the more common causes of tinnitus. Venous sinus dominance, transverse sinus stenosis, and venous diverticulum are often mentioned in clinical series of tinnitus, but to our knowledge have not been the most common observation in any series. The obvious question raised by our results is “is the dominant venous sinus system causal or simply an incidental finding?” To answer this question, a prospective aged matched asymptomatic control group should be evaluated with CTA/V and compared with the findings in our study to determine whether our results are significant or simply anecdotal. Given the fact that approximately 59% of the population has a dominant right-sided venous system, this finding may be difficult to prove statistically; however, this study is ongoing at our institution.11 The same method can be used to assess whether an isolated thinned but not dehiscent sigmoid plate could cause PT. Our preliminary results indicate that CTA/V can be a valuable tool in the imaging work-up of PT. In contrast to the traditional imaging work-up that may involve multiple radiologic examinations, CTA/V allows evaluation of the middle and inner ear, arterial, and venous structures with a single initial examination. CTA/V should not replace conventional angiography if dAVF is the suspected cause of the PT. This work was previously presented as a paper at the 42nd Annual Meeting of the American Society of Neuroradiology; April 27–May 2, 2003; Washington, DC.